Brief history of the modern Turkish cymbal and etymology of terms. 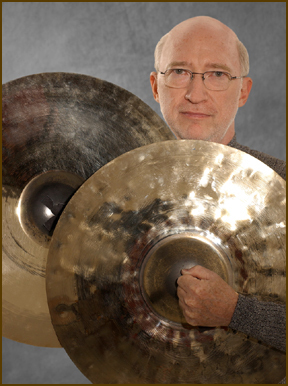 Discussion and demonstration of basic types of crashes, special effects with two plates, techniques for suspended cymbals, and options for selecting and combining cymbals. Discussion and demonstration, using excerpts from the symphonic and contemporary repertoire, of approaches to performance issues such as misleading and/or ambiguous notation, dynamics and instructions. Consideration of the concept that imaginative and creative interpretation is encouraged when problems are viewed as opportunities for personal expression. 1.5 to 2 hours.